Fantastic chocolate cookie with a gooey surprise inside. In a large bowl, cream together the white sugar, brown sugar, and butter until light and fluffy. Beat in the eggs, one at a time, then stir in the vanilla. Combine the flour, cocoa, and baking soda, gradually stir into the creamed mixture. Cover dough and chill for at least one hour. Meanwhile unwrap the candies and microwave on a place on low for 30 seconds, squish down so they are more flat then square. 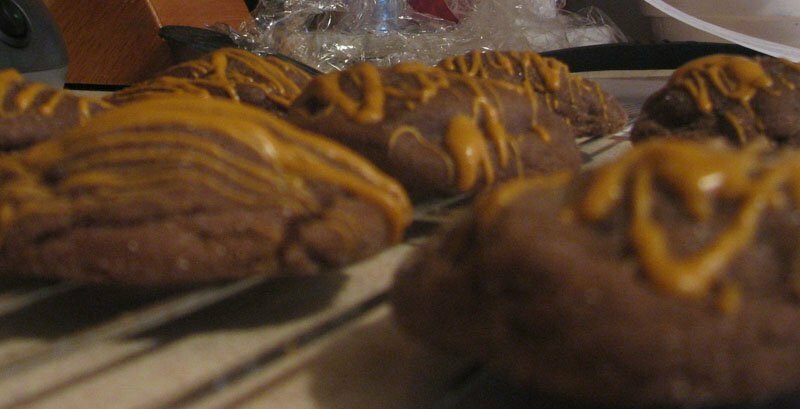 With floured hands, wrap about 1.5 tablespoon of dough around each piece of candy, completely covering the candy (tip: flatten out dough slightly, press caramel into dough and fold dough up around the top of the caramel). Roll each ball in the remaining tablespoon of white sugar. Place 2 inches apart on an unprepared cookie sheet. Bake for 7 to 10 minutes in the preheated oven. Cookies should be set and slightly cracked. Melt the white chocolate chips in the microwave oven, or in a bowl over simmering water. Drizzle over the cookies when they are cool. If the melted chips are too thick, add vegetable oil to achieve the desired consistency.